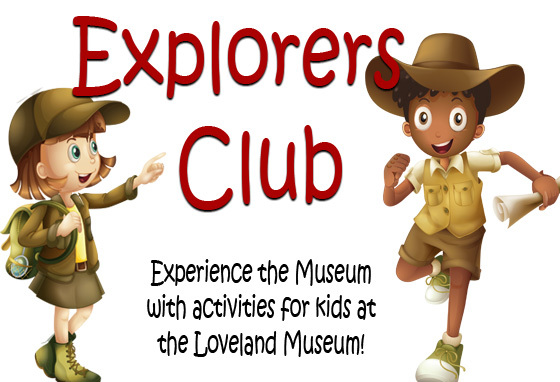 Activities for kids at the Loveland Museum! Stop by the Museum front desk and start the journey with your own treasure map and begin experiencing the exhibits in a unique way. Explore, have fun, and collect treasure as you complete exhibit cards. With each card, you will learn more about the history or art exhibit through trivia, puzzles, and activities for further exploration. Every time you visit is your opportunity to complete another card and continue along the trail. Become a master explorer as you complete your journey and collect fun prizes along the way! All the BINGO cards have been updated and changed! Barnes Fountain (learn what made our fountain famous) temporarily unavailable but will return soon! New exhibit cards will be released quarterly – visit us often and learn something new each time. Coming soon – Sweetheart City, Loveland Jail, Historic Toys, and MORE! 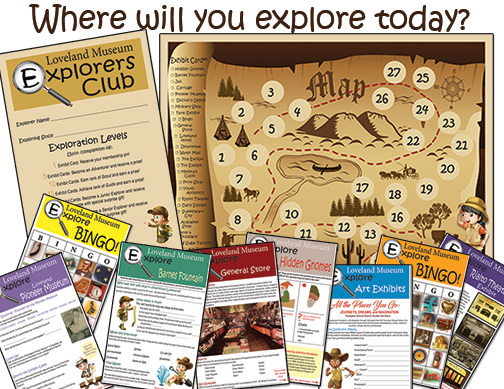 Check back often for Explorers Club updates and activities!